Sample is 3/4-by-3 1/8-inch square-edge solid strip. Color: Heartwood is light to dark reddish brown, lustrous; sapwood is light brown to pale with a light pinkish tone. 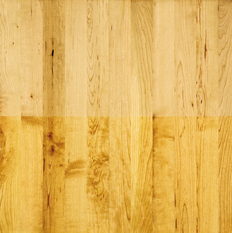 Some flooring manufacturers steam lumber to bleed the darker heartwood color into the sapwood, resulting in a more uniform color. Grain: Fine, frequently wavy, uniform texture. Distinctive flake pattern on true quartersawn surfaces. Texture is satiny, with some gum pockets. Variations Within Species And Grades: Significant color variation between boards. Hardness/Janka: 950; 26% softer than Northern red oak. Dimensional Stability: Above average (change coefficient .00248; 33% more stable than red oak). Durability: Strong, moderately hard; excellent shock resistance. Usually considered too soft for an entire floor - mostly used for borders and accents. Comments: High in bending strength. Light-sensitive; strong color change upon exposure to light.